In her recent People Magazine interview, intergalactic star Barbarella revealed the family tragedy that underlies the happiness of her life of glamor and fame: she has a twin brother who is mentally retarded. His name is Diabolik. (Pronounced “Dee-ah-ball-ick”.) Their father was Dino De Laurentiis. He made both of these films in the same year, around the time that he crossed the Atlantic to bury Hollywood under a towering mountain of garbage. This film has one foot on each continent, being set in Italy but performed in English. John Phillip Law is probably remembered more for his supporting role in Barbarella than for any more substantial role. But this was his chance to shine as a charismatic lead. Alas, luminance failed to occur. He went on to a long career in film after this, but not to a distinguished one. His only other important lead role appears to have been in The Golden Voyage Of Sinbad. By the eighties he was doing TV soaps. With good reason... he may bear a strong physical resemblance to the younger actor Jude Law (though they are apparently not related), but the resemblance does not extend as far as both of them being able to act. 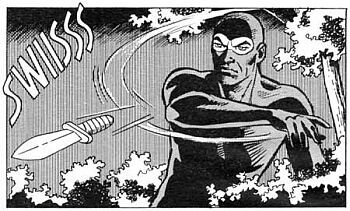 Lemne put it this way: when Dangeresque 3 comes out, it will give Diabolik some pretty even competition. They’re going for a James Bond vibe here: action-hero super stud with babes (well, one babe) and gadgets. Except he’s not a government agent, he’s just a super-thief, who goes around stealing stuff and killing cops. Then when the government really starts to pursue him, he starts blowing up tax offices and attempts to bankrupt the entire government. This appalling character was recently adapted for TV animation for Fox Kids® in Europe! Naturally they wussed out and make him sort of a good guy. The original comic is Italian: the character was created by Angela and Luciana Giussani. That’s right, an evil Bondoid invented by women. (Which probably explains why he’s monogamous.) The comic is still made (though the Giussani sisters are gone) and apparently still popular. The movie looks so exactly like the comic it’s as if the comic was drawn from the movie instead of vice versa.